This is the ultimate Polish soup recipe. The soup is called “Grochówka” which means it’s made out of dried split pea and few more typical for Polish soups ingredients. 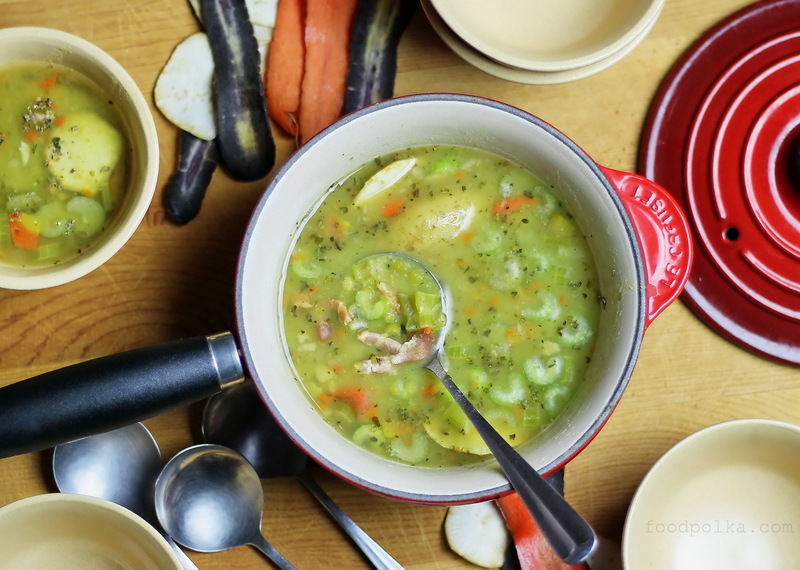 If you drive across Poland you will notice roadside stands and food shacks in the woods inviting you to have a bowl of the “Grochówka Wojskowa” or “Grochówka Polowa” which translates into the “Military Split Pea Soup”. Stop by and you will most likely end up with something really tasty. Something that is very similar to the American split pea soup, except tastier, more complex and made with dried split pea that is yellow in color. Polish Grochówka is associated with military food, where it still remains a popular dish. This is because pea soup is nutritious, filling, cheap and can be easily prepared in large quantities. Military pea soup is said to have to be thick enough to put a spoon straight up in it. I like mine little thinner. Though the pea soup is normally prepared in messes, the dish is typically associated with military field kitchens. By popular demand, decommissioned filed kitchens are often present during popular outdoor events in Poland, like municipal fairs or festivals. Also some Polish food trucks specialize in this somewhat old fashioned and ridiculed – for obvious reasons 😉 dish. But when prepared right, it can be considered a gourmet soup. The secret ingredient that makes Grochówka superior to its American version is herb called Marjoram. I recommend that you try my recipe especially if you have Christmas leftover ham or smoked bacon or other smoked meat. Like smoked pork neck bones. Smoky meat makes it extra tasty. Soak split peas overnight or even 24 hours (use at least twice as much water as pea). Place soaked peas into a larger pot and add water (the water should be about 3 ” over the pea level), add the bay leaves, 2 tbs marjoram, allspice, cumin, parsnip, garlic, parsley, carrot (whole), potatoes, smoked meat and cook covered for about 60 minutes. Take potatoes and carrots out of the soup and chop them into smaller pieces, then add back to the boiling soup along with sliced celery stalks, stir well. Boil for the next 20 minutes then add remaining marjoram, turn off the heat and let the soup steep for at least an hour. Reheat and serve with crispy rye toast and fresh marjoram springs (if available).